I had another great opportunity to make something for River City Extension. This time, the poster for their record release show. I wanted to do something reminiscent of an older movie poster, which wound up only serving as a loose guideline, and I was somehow influenced by the thought an old army band or something like that, which is where I was pulling the color scheme from. This show is going to be insane, and I highly recommend everyone doing everything they can in order to get there. Something tells me this night is going to be one you won’t want to miss. You’ll also finally be able to purchase The Unmistakable Man, which you all know by now, I designed. Confirm your attendance on facebook! 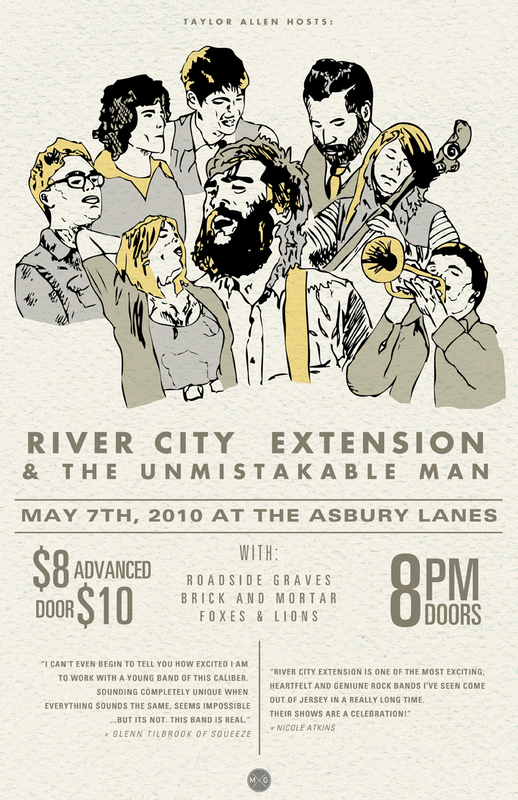 This entry was tagged army, asbury, asbury lanes, brick and mortar, design, facebook, foxes and lions, glenn tilbrook, matt goold, new jersey, nicole atkins, old, Poster, river city extension, roadside graves, the unmistakable man. Bookmark the permalink.